Good morning, everyone. There's no rest for the wicked at Supernatural Central over the holiday season. People keep dropping in for tea and cookies or just a little chat. Today we have Nora Penn in the house. NP: My father died protecting us from two robbers when I was a little child. The main character, James Dresden is like him, at least how I remember. He is strong, smart and would do anything to protect his daughter and wife. Putting him in a disaster scenario works really well and represents what does being a human mean to me. SC: Well, that must not have been easy for you. I'm glad you have turned that energy into something positive. .Do you believe in the paranormal and if so, do you have an experience you can share? NP: Oh, I do believe in the paranormal. For years, I dreamt about being haunted by a ghost and every night I woke up, opened my eyes and saw a silhouette moving behind the curtain. It was an older woman who sometimes spoke to me, but only a few words: Wake up! Wake up! SC: Chilling! What titles are you working on now that you can tell us about? NP: I’m working on the second installment of Bite Me Spider. 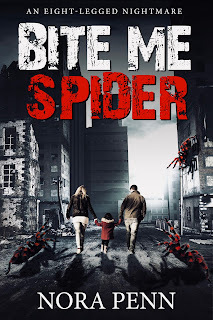 It will show the readers how the spider apocalypse began and how James will become not just his family’s but the whole world’s savior. Sonja could barely see the road ahead for all the tears in her eyes. She had been driving for half an hour and had been crying for the entire time. It wasn’t a sobbing, heaving cry, like one might expect of a woman who had moments ago been widowed of her husband of fifty years. Rather it was a steady, unceasing flow, as if she were a fountain filled with pure grief. At some point she stopped wiping the tears from her face and simply let them run down her cheeks. As she drove along 95 South her mind replayed a hit parade of memories of her and Bill. These memories went back to when they had first met, all the way back through their time dating and then getting married, their raising their children, and then their children’s children, and then living in the lighthouse and fighting off the giant spiders for their survival. As the old woman reminisced she was painfully aware of a hollow place in her soul. It was the place in her life that her husband had occupied. It was more than a hole. It was another half of her that had gone missing. No, not gone missing. This half of her had been ripped away. And as sure as up is up and down is down, Sonja knew that she would never be the same now that the love of her life was gone. The only thing keeping the old woman going at that point was her mission. Her sanity hinged on the fact that she was entrusted with saving Carol’s life. In a strange way she was grateful for the task. If she, Sonja, could play a role in saving the child, she thought to herself, she could shuffle off this mortal coil knowing that she had done one last good deed. It occurred to her then that once she had caught up with James and Carol and informed them about the true nature of the spider’s bite, she could simply drive her car off the road and let herself be reunited with her husband in heaven. Because her emotions were so chaotic and her thoughts so scattered, and her eyes so misty with tears, Sonja’s driving was extremely erratic. On several occasions she had almost driven off the road and only managed to save herself by swerving back at the very last moment. Compounding the danger was the fact that she was speeding along at 90 miles per hour. Having a highway that was empty of cars (except for the occasional abandoned vehicle) had given her a false sense of safety. What’s more, she figured that James would be driving fast and she deduced that if she was to catch him she would have to drive even faster. As she drove she remained just aware enough to keep on the lookout for spiders. The eight-legged bastards had a habit of suddenly scuttling out in front of vehicles. Back when the spiders were no larger than squirrels this was more of a nuisance than a real danger, but now that the spiders were as big as bulls they posed a far more serious threat. But as fate would have it, she hadn’t seen any thus far. The unexplained growth of the spiders since the beginning of the spider apocalypse meant that survivors like Sonja had grown accustomed to looking for the larger specimens, as they posed the most obvious danger. But the fact that is that there were still plenty of smaller spiders creeping about, such as those that had hatched inside of her husband. As if further evidence of the danger of the smaller spiders was needed, a normal-sized Black Hermit Spider was crawling up the back of Sonja’s chair as she drove. The Black Hermit Spider put its finger-like legs over the top of Sonja’s chair. When the creature saw the exposed neck of the female human, its eyes gleamed with a terrible malevolence. Sonja’s thoughts turned to her children and her grandchildren, especially Dylan, who was her favorite. She hadn’t heard news of him since the spider apocalypse began, but she had a feeling that he was still alive. He was such a hearty soul – a lot like this James fellow – and he would certainly put up a fight. If anyone could survive the spider apocalypse and start building civilization afresh, Dylan was the one. Sonja snapped out of her reverie just in time to turn the wheel and follow the curve of the highway. The tires squealed but she was oblivious to the danger. Instead of slowing down to a more reasonable pace, she pressed the gas pedal down further. The car was going so fast the frame of the vehicle began to shake. The Black Hermit Spider, meanwhile, put its legs over the ridge of Sonja’s collar. The creature was about the size of a human hand, and just as heavy. If Sonja had been thinking clearly she would have felt the weight on the back of her shirt. But she was too lost in her thoughts to notice. The spider’s fangs were hovering over the exposed flesh of the back of Sonja’s neck. As she wrapped up her tearful soliloquy, the spider drove its fangs into her skin. Sonja winced as she felt the needle-like projections burrow into her flesh. There was a sharp sting and then a powerful numbness as the poison was injected into her system. At first the numbness was uncomfortable, but then it spread out like rays of sunshine freed from behind a passing cloud. Instead of feeling heavy she began to feel light. Sonja closed her eyes. A spasm passed through her body and her spine stiffened, causing her legs to extend and her foot to press the gas pedal to the floor of the car. The vehicle shot forward like a rocket, crossing the highway at a sharp angle and smashing through a partition. On the other side of the partition was a deep ditch waiting to accept the plummeting vehicle. But this isn’t what Sonja saw. What Sonja saw was a multitude of faces. The faces belonged to everyone she had known in life, going back to when she was a child. They were all smiling at her as if she had just walked into a surprise birthday party being thrown in her honor. Behind the familiar faces was a bright light and inside this bright light was her husband Bill, who looked just as happy to see her as the rest. He held out his arms to her. Sonja was suddenly no longer in the car. She was in her husband’s arms. And in her husband’s arms she would stay. Nora Penn writes fast-paced horror novels with strong, relatable characters. Her favorite authors are Dean Koontz and Stephen King. She released her first novel, Bite Me Spider, in November of 2017. She lives in New Hampshire with her husband, who endures her various idiosyncrasies in return for being the first to read her new novels. They welcomed their first child, a daughter, on September 11, 2015.